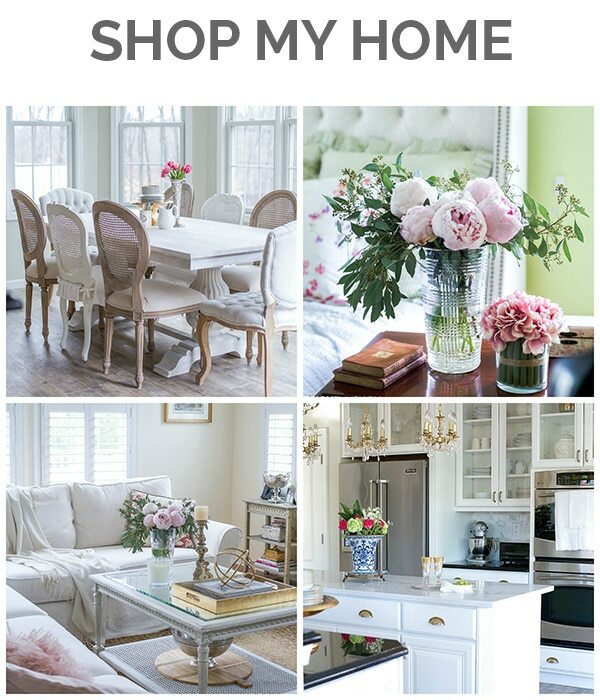 In this post: There are certain seasonal design elements you can find many cozy homes. Here are 9 ways to add winter warmth to your home. You know those amazing cozy homes that remind you of a Swiss chalet? If there’s one thing I want at this time of year it’s to be warm and cozy at home. After all the colorful excitement of the holidays, as the year begins I’m looking to slow down, clear away all the clutter and spend time at home recharging. 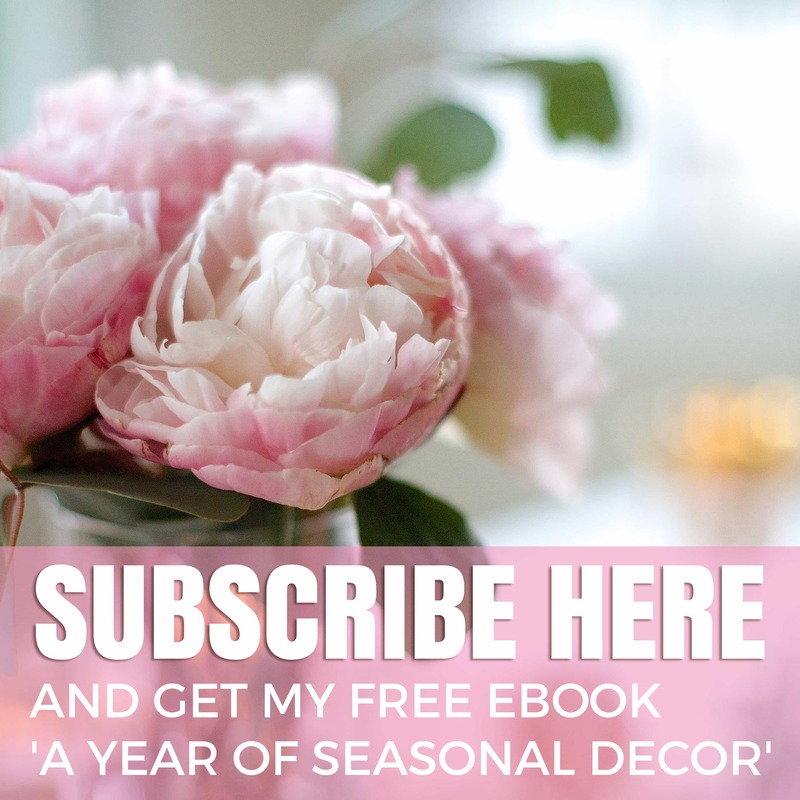 Early in the week I posted my January home decor inspiration, so now I’ll begin to show you how I’m applying those ideas to my home. Here are 9 ways to add winter warmth to your home. I love the look of a chunky sweater knit pillow, especially in warm creamy tones. 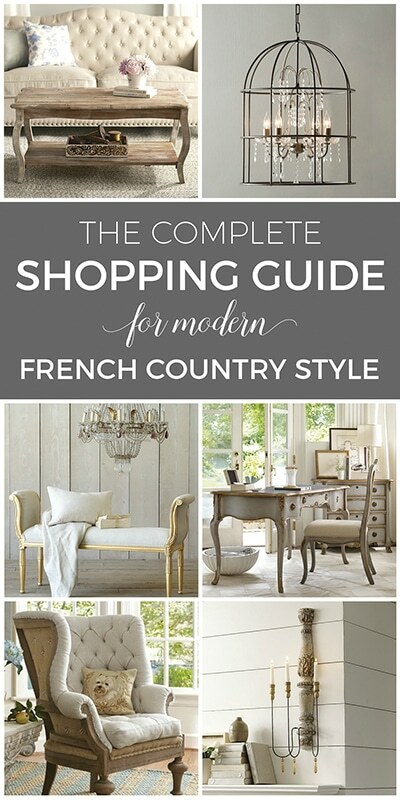 It exudes a feeling of warmth that makes you want to curl right up with a book by the fire. 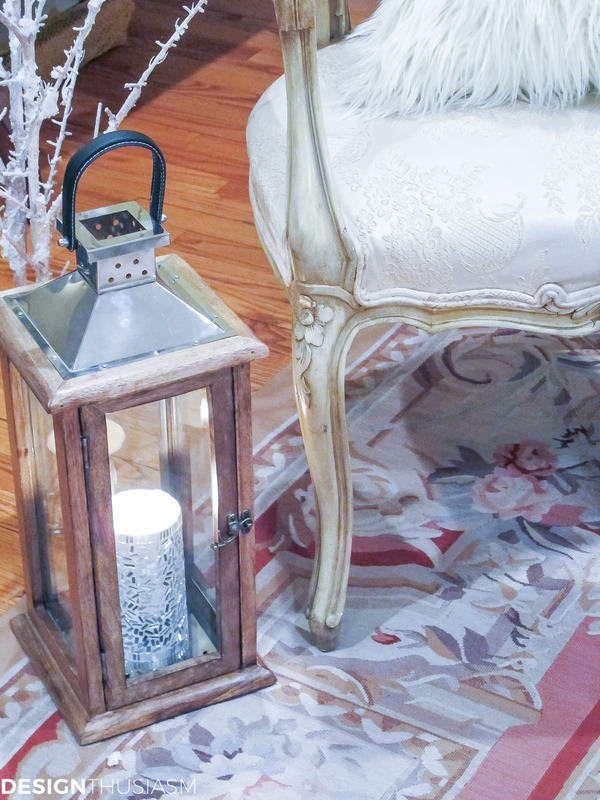 Candles lend a warm glow to a room and I enjoy the woodsy feel of this charming lantern. You can see the bare white branches in the background, another wintery nod toward nature, with little flecks of faux snow. 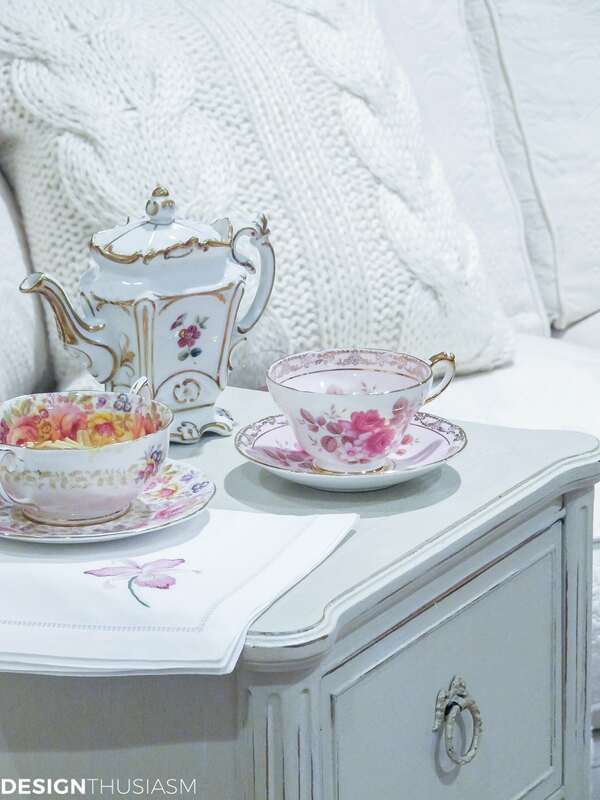 Nothing says cozy like a cup of tea, particularly when served in a delicate china cup. Pops of gilded trim invite the light to glint off of it. A shaggy long haired pillow adds another touch of warmth. 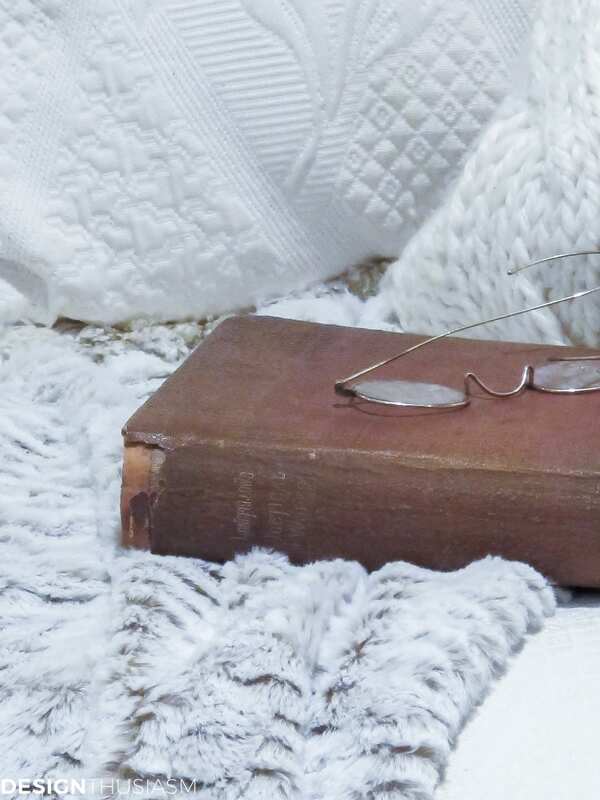 A simple cashmere throw in a complementary tone balances nicely against the texture. While I love the clean look of all the whites layered together, a buttery yellow wall envelops a room in sunlight, when there’s a shortage of sun outside. 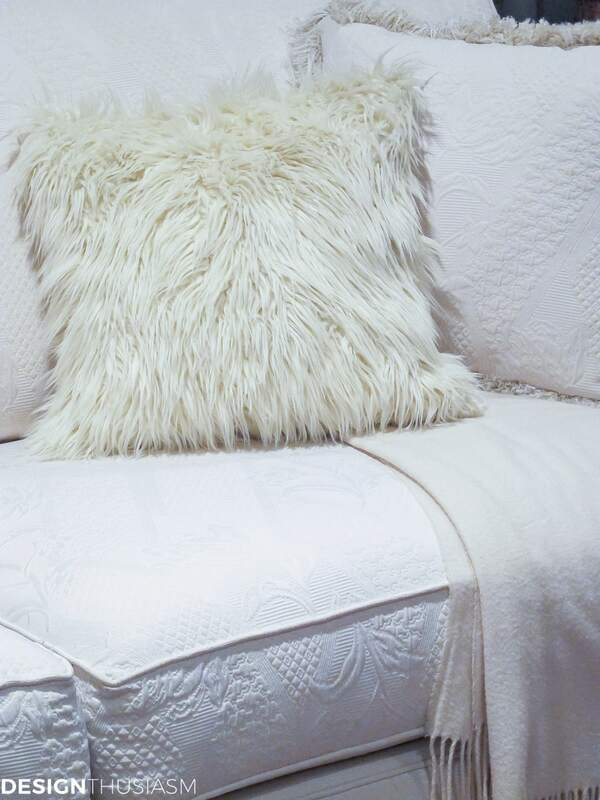 For really cold nights a faux fur throw can’t be beat. Its soft warmth is a true pleasure. 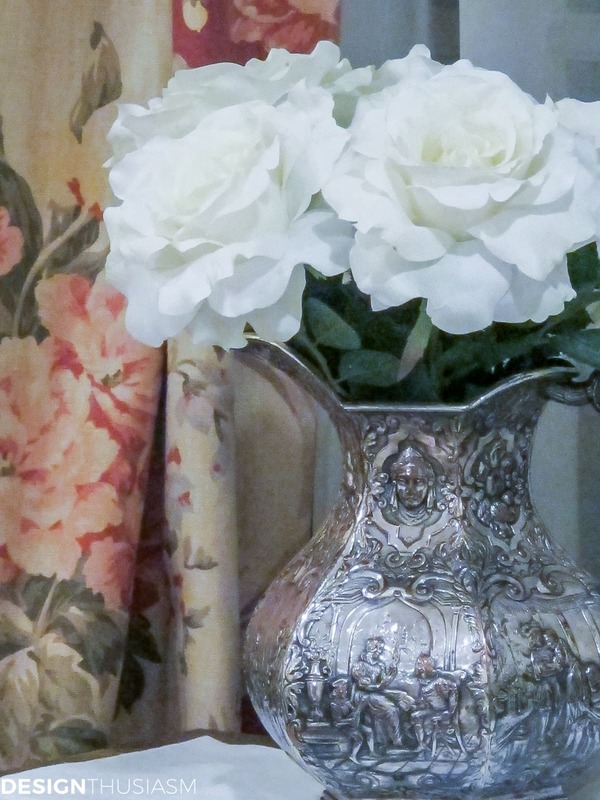 The creamy mood extends to the florals, as well. 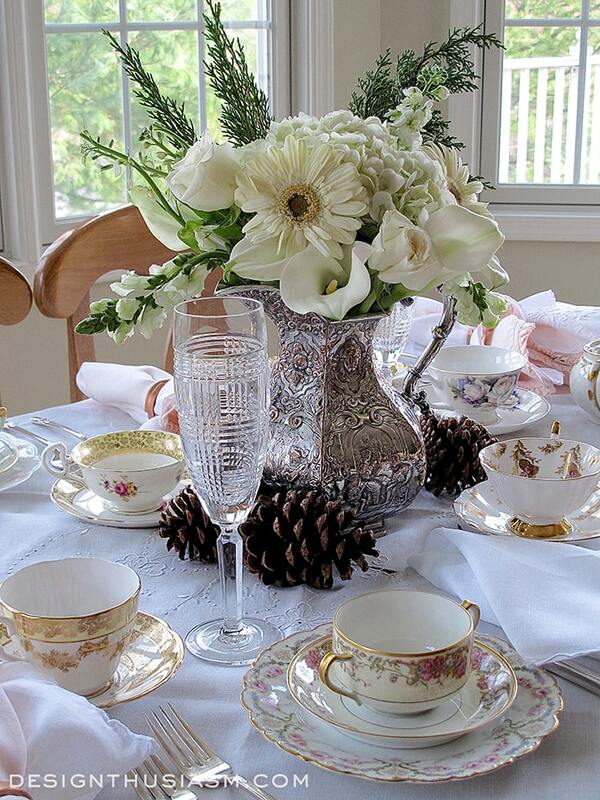 I love fresh flowers, but use silks in addition, especially in winter when the selection of fresh is limited. The brightness afforded by the interplay of all these textured whites hides the grey gloom right outside the window. 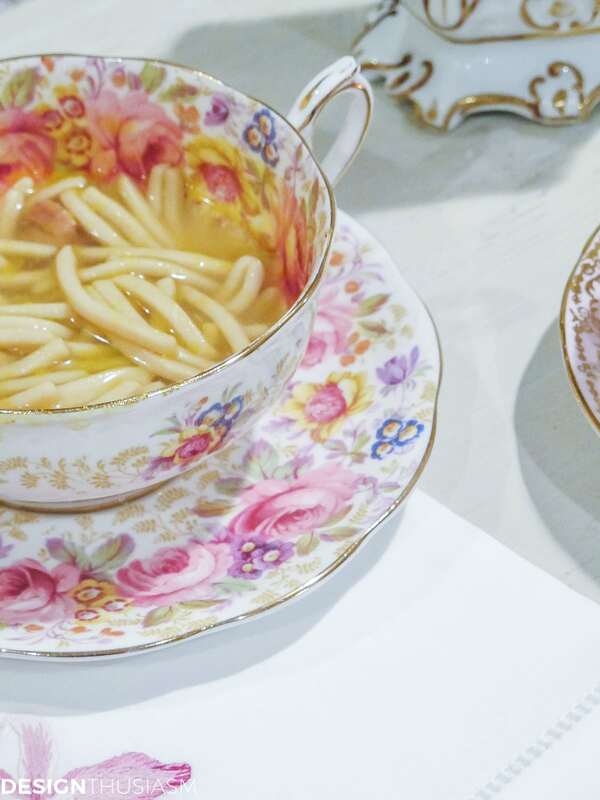 The final note is a hot cup of chicken soup, presented in a charming vintage china bowl. Napkins are from Fragonard, Paris. It all does look very warm and cozy, but what I love best is that matelasse-style sofa! 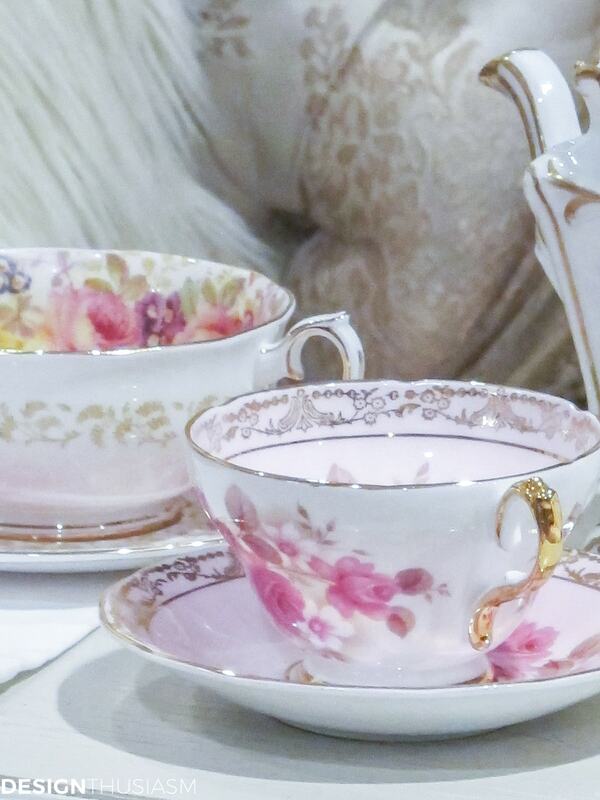 That soup cup is just lovely, too! Thanks, Maria!! 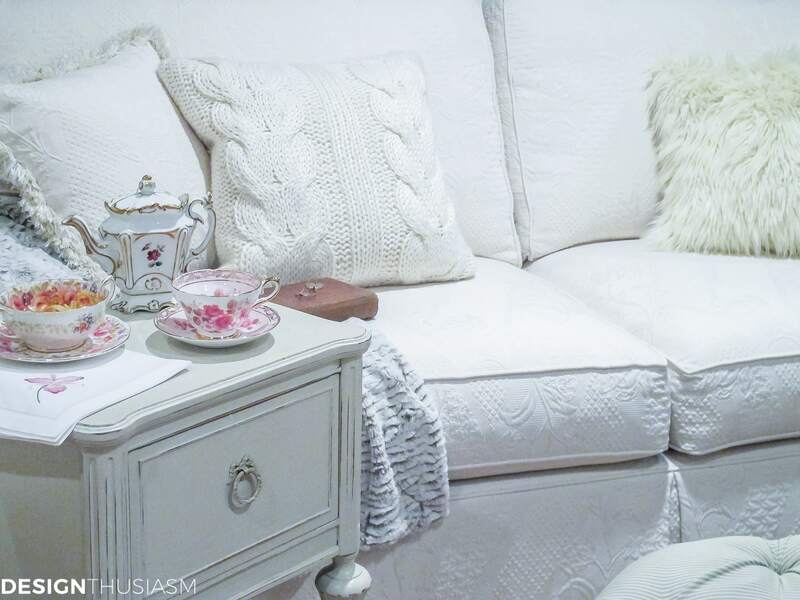 Yes, the creamy feel of the sofa is what inspired the whole thing… 🙂 Thanks for stopping by! I love all of the creamy tones, Lory! 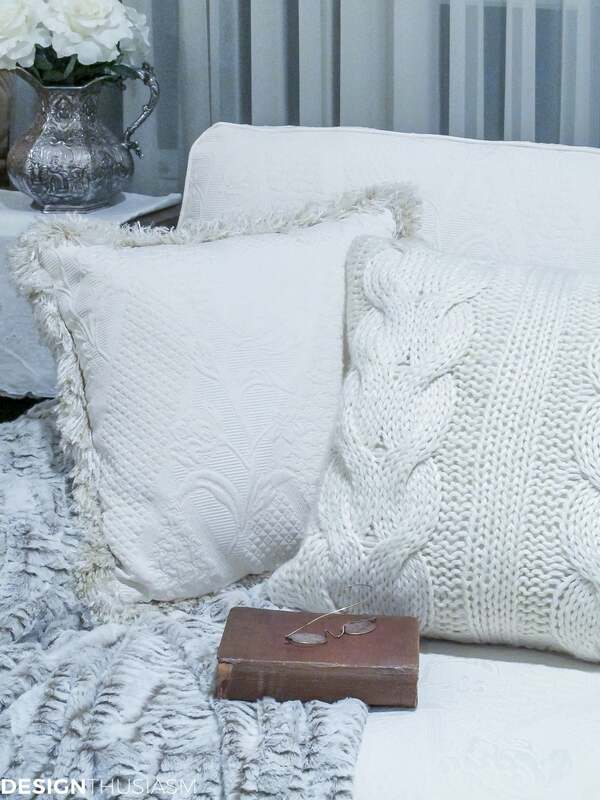 The cable knit sweater pillows have always been a favorite of mine; and I keep faux fur throws on our sofas, as well. There’s nothing like wrapping up in a throw, with a fire in the fireplace! You certainly have created a very beautiful and warm home. Everything is bright and inviting. The cable knit sweater pillows are charming. It’s all very cozy and inviting. I love your silver pitcher! How fun. This looks amazing. Beautiful pictures of a gorgeous space. Thanks tons for linking to Inspire Me. What a wonderfully warm and cozy space! Beautiful! I love all the gorgeous pillows! 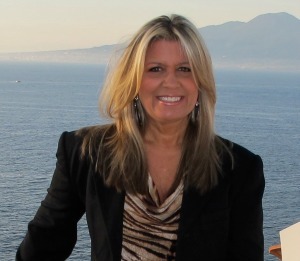 Gorgeous, cozy and elegant, Lory! I love your gorgeous home Lory. It is certainly cozy and warm. I also love all the romantic touches through out. Great use of colors and textures. Happy New Year. May you have a great 2016. Thank you so much, Janet!! What a nice thing to say… 🙂 I visited your blog as well, and I think we have similar taste. Your posts are just lovely! Thanks for stopping by and Happy New year to you, too! Lory this is so elegant and inviting. I love sweater pillows so much! Fabulous job! I would love for you to share this at our What’s it Wednesday Linky Party! Fantastic way to start the year with inspiration. Btw, would love to have you link up at our Share It One More Time party on Saturday mornings, too! Thanks again for the kind words!! What lovely touches you’ve added. The faux fur pillow is really unique. It puts me in mind of the hot pink ones from the seventies! 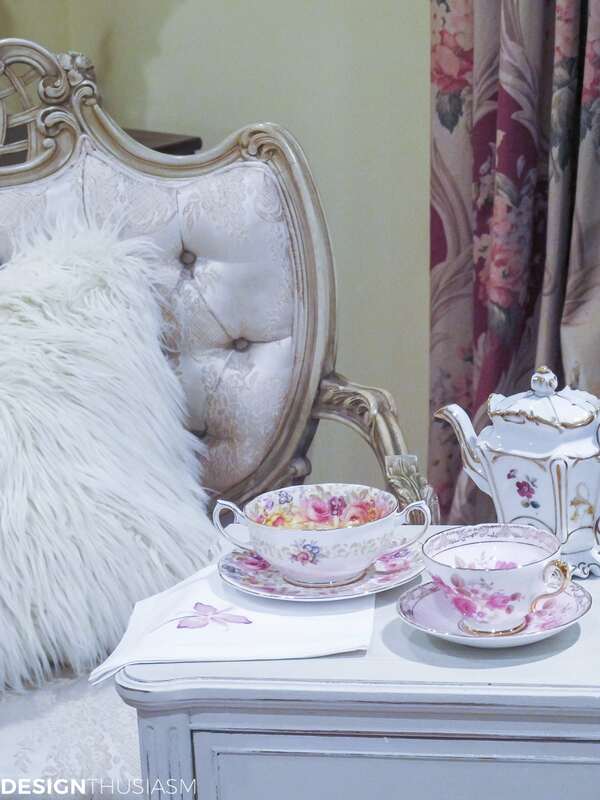 this is so lovely.. the pillows and lantern and throw..and the soup in the gorgeous China bowl! such wonderful photos, too. thank you for the inspiration. Ah, my pleasure to share. Thank you so much for the kind words and for taking the time to tell me how you feel… 🙂 Thanks for stopping by!! You have sincere talent in not only design, but your photography is stunning – it actually made me “feel” the textures jumping off the screen! I live in the Canadian Arctic, so light in the winter is at a premium as we go down to just under 3 hours of daylight a day at the darkest point. I chuckled to myself as I realized I was reading this post while snuggled under my winter white faux fur throw, with cable knit slipper booties on (all done in front of a roaring fireplace! ), so I guess I am a true believer in what you are saying. Since we have no stores in our wee fly in/out town, I guess I need to get the knitting needles out and make some sweater pillow covers; seeing yours has made me realize that my living room could look so much cozier with them. Thanks so much for the inspiration and again for sharing your exceptional talents! Thank you, Chris!! I love your comment… 🙂 How nice that you can knit something like that. 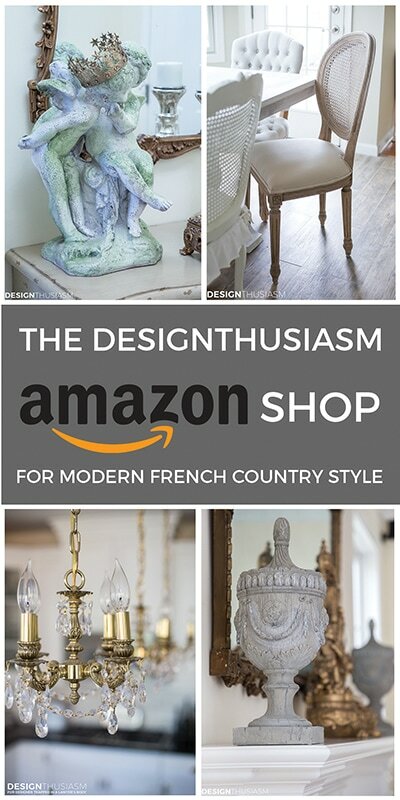 But if you want, you can also purchase online. 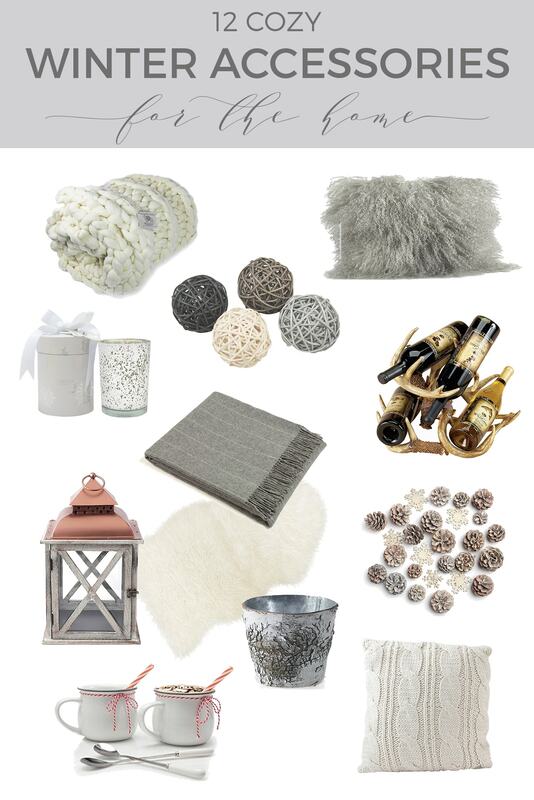 I have another post from last week that links to many more cozy winter ideas. 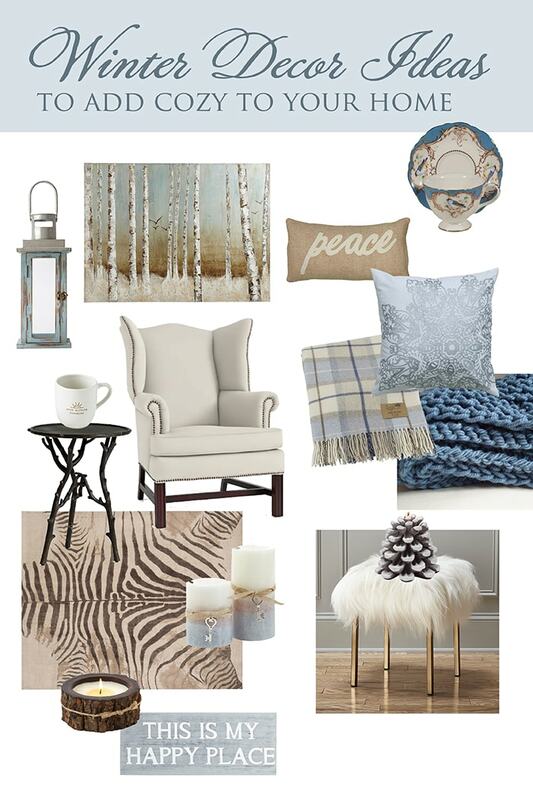 You can see that one here: https://designthusiasm.com/winter-decor-ideas/ I guess I should also go back and add source links into the post you commented on. Thanks for visiting!